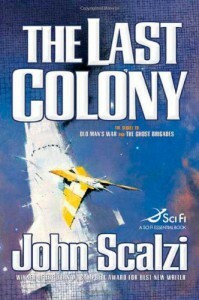 This is the third book in the Old Man's War series. This book was far more interesting than the second book. The main character from the first book is once again the main character in this book (he wasn't in book 2 at all). Basically he and his wife (who was in book 1 and 2) are selected to be the leaders of a new human colony. And then the whole thing gets screwed over because politics. Book 4 is a re-telling of book 3 but from the point of view of the adopted daughter of the main character and his wife. I already checked it out of the library so I'm going to read it anyway. However, despite there being 2 more books after book 4, I'm done with Old Man's War at that point. I've looked up books 5 and 6 on Amazon and the plots don't interest me, mainly because John (book 1 and 3's main character) and Jane (his wife) don't seem to be in either of those books. And it's their story I'm interested in, not anyone else's. Plus book 5 and 6 aren't novels but collections of short stories set in that particular universe and I don't like short stories.